While Africa is the world’s most rapidly growing market for mobile telephones, the Middle East mobile market is characterized by some very high penetration rates and continuing healthy subscribers’ growth rates in most countries, according to the report issued by Internet World Stats. The Arab Countries in the MENA region (Middle East and North Africa) have totaled around 78.6 million internet users as at December 31st 2011 representing 26.45%, a total population estimated at around 297.16 millions (excluding: Iran, Sudan and Israel). 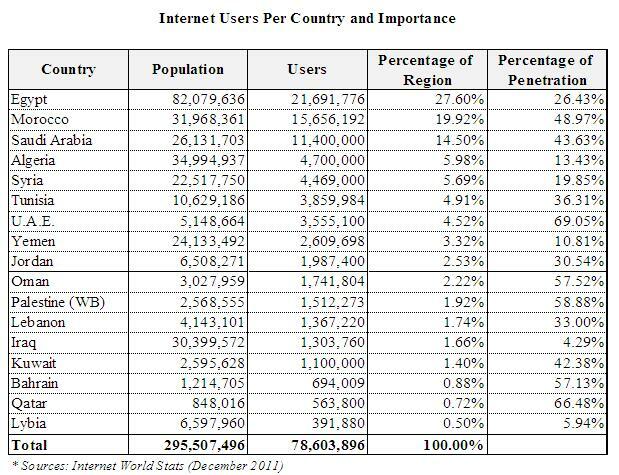 In terms of the number of internet users, Lebanon ranks 12 with 1’367’220 users (behind Palestine, Oman, Jordan and Yemen), Egypt comes first with 21’691’776 users, followed by Morocco (15’656’192 users), Saudi Arabia (11’400’000 users). However, in terms of population penetration, figures and ranking differ substantially from one country to another depending on socio-economical and political factors. The Emirates have the highest penetration rate (69.05%), closely followed by Qatar (66.48%), Palestine (58.88%) and Oman (57.52%) respectively. Lebanon can do much better than the actual 33% rate of population penetration.